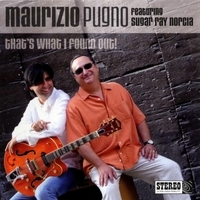 Maurizio Pugno’s first release on Pacific Blues Recording, is a mix of jump and Chicago Blues all laced with Sugar Ray Norcia’s warm voice and harmonica. PAOLO CECCARELLI - Rhythm Guitar on track 12. RICO MIGLIARINI – Harmonica on 9. DAVIDE DAL POZZOLO – Tenor Sax on 5. FIRSTLY I would like to thank Sugar Ray, for his rare musical talent and his generosity and kindness with me! OK now you ask “But who is Italian with a name too Italian to be true?” – well, no one in particular only some one dedicated to the guitar, who lives in Gubbio, a little city in Umbria with a Medieval atmosphere, but where the humid air of Mississippi has arrived at our door modified by mild Mediterranean currents. Talking about oneself is boring and I will spare you too many yawns with s long biography, suffice to say, I’ve been with the Blues for 25 years! I met Sugar Ray Norcia in the summer of 2004 during our first Italian tour of Blues Festivals and antique piazzas. My first approach to Sugar Ray’s music was one of a fan more than professional having in my record collection practically all his recordings. Then we started performing together and through our professional collaboration developed a reciprocal respect and a strong friendship based on a common sensibility probably due to coming from the same Italian roots. In the meantime I realised the need to produce a solo record, nor based only on the guitar and hence just another “Blues guitar hero” number, but aimed at quality drafting of the tracks – and so I started to write and arrange for this project. Spontaneously I thought of Ray – his authentic voice and harmonica so attached to the tradition – and I “took advantage” of our friendship! Ray straight away was enthusiastic with the idea and the songs and began to develop and weave into the melodies and vice versa, until on a hot tour 2005 we finished the work, sat in the back of a van on in Hotels escaping from the heat - the rest came playing and “just hanging around”! At the end of the tour we entered on old Theatre in my quiet little city surround by ancient palace and the perfume of red wine emanating from the local canteens that still exist. The unusual atmosphere of a place that’s given birth to antique music, was truly inspirational and the feeling between the musicians was immediate, giving rise to a truly memorable sessions. With artists such as Alberto Marsico on organ and piano, Gio Rossi on drums, Lucio Villani on upright bass, and with support from Horn Section (that appear in some recordings) directed by my brother Mirko, we start to play “That’s What I Found Out”, the first track recorded, with my old Stratocaster plugged into a 15 watt amp, and the rest of the band going like a bomb! We tried the piece a couple of times to structure it a little, and then we were off! Even in the finale, where it was foreseen a fade out, something magic happened that cased me to continue to improvise over the voice of Ray right to the end! We looked at each other satisfied and continued on with the scheme only to be interrupted by a glass of “Montefalco” red wine, grilled meat and “brustengo” cooked by an elderly lady in the little eating house nearby! At the end of the day we had ten good numbers and a pleasant sense of a satisfied appetite! The next day we could no longer use the theatre and many of the musicians mentioned had to leave. Ray and myself had other songs still to perform, with the help of the rhythmic section of the Rico Blues Combo (Mirco Capecci on electric bass, Giuliano Bei on drums and on one number my old friend Rico Migliarini on harmonica). We all managed to get into the recording studio to finish everything! Alberto Marsico who was still in Gubbio continued to work with us in all the sessions, and I have to say it didn’t go all that bad in the studio too! We relaxed with very good home toasted coffee whose aroma filled the atmosphere between amplifiers like some kind of pagan incense! Ray again made the difference, singing and playing in an extraordinary way! – and I – well I took some of my guitars, for this sessions (a Gretsch Nashville, a Mexican Telecaster, my old 1960 Stratocaster and a Gibson E335), I plugged directly into a Bassman (1959 reissue), or a 1965 Supereverb or a small Blues Junior! Also playing live with the minimum of pedals or anything artificial. The recording went like that - and talking in football terms – without looking at the ball!!! The Blues is a universal language. This is a concept that is commonly understood and widely practiced, yet still seems to escape the grasp of the blues media and fans alike here in the U.S. The international blues scene is populated with talented and accomplished players the whole world over, but this fact has yet to fully penetrate the market here in the States. It's not a completely foreign idea... think back to the 60's when the British invasion was in full swing. Young artists from the U.K. such as Peter Green's Fleetwood Mac, the Rolling Stones and John Mayall's Bluesbreakers featuring Eric Clapton were in complete awe of legendary American blues icons such as Muddy Waters, Howlin' Wolf, Slim Harpo, Jimmy Reed, T-Bone Walker and Freddy King. It wasn't until artists abroad had absorbed those sounds and started feeding the music back to the American public at large that we actually began to appreciate what we had in our own backyard. Today a similar situation has developed. Young musicians in countries as far off as Sweden, Norway, Finland, the Netherlands, Germany, Belgium, France and Italy have studied and assimilated both of yesterday's and today's American blues artistry, extracting the very best that each has to offer. Listen closely and you can hear the influences of Jimmie Vaughan, Duke Robillard, Ronnie Earl, Alex Schultz, Kid Ramos, Kirk "Eli" Fletcher, Junior Watson and Hollywood Fats. Artists that for the most part, now struggle to make a living in an American culture that currently embraces electronically fabricated music, hip hop beats, and manufactured pop stars. Hopefully now with the release that you currently hold in your hands, all that's about to change. Recorded mainly at the Gubbio Theatre in Italy, this project is the vision of Italian blues guitarist Maurizio Pugno, and features an overwhelming assemblage of talent. Maurizio has long been a part of the Italian blues scene contributing his abilities and expertise to the Rico Blues Combo for the past 10 years with history dating back even further in the Wolves Blues Band prior to that. For this recording Maurizio collaberated with one of America's premiere blues vocalists, Sugar Ray Norcia, whose musical resume includes work with Ronnie Earl & the Broadcasters, Roomful Of Blues, as well as his own celebrated band, the Bluetones. Not merely relegated to sideman duties, Maurizio generously allows room for Sugar to step into the spotlight, contributing all of the albums lyrics and vocals, in addition to supplying his masterful tone and technique on the harmonica. Alberto Marsico, who has previously lent his expertise to Italy's very own blues elite including Egidio "Juke" Ingala and Enrico Crivellaro, is featured throughout on piano and Hammond B3, along with the stellar rhythm support of upright bassist Lucio Villani and drummer Gio Rossi. Members of Maurizio's current band, the Rico Blues Combo featuring Rico Migliarini on harp, Mirco Capecci on electric bass and Giuliano Bei on drums, provide additional support. The final icing on the cake is the full horn section consisting of Davide Dal Pozzolo on tenor sax, Mirco Pugno on trumpet, Giordano Palazzari on trombone, Tiziano Fioriti on tenor sax and Simone Crinelli on baritone sax. With the identifiable American blues talent of Sugar Ray Norcia helping to lead the way, perhaps this release can find a home into the hearts of the American blues audience, educating them about the amazing talent brewing oversees, while in the process also allowing us to learn to appreciate the talent we have living right back here at home.